All of our Bartenders have at least 3 years of experience and are T.I.P.S, or TABC certified according to the state. 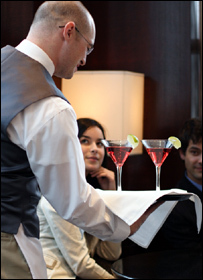 We require all of our bartenders to be professionally trained with years of experience. All our packages includes a FREE One Hour planning consultation. Our Planning Consultants will assist you with product options; as well as, the proper quantity of product your party will require. Special events coordinators add value and assist in the process of putting together an event that is attended by the public or for a select group of guests. Planning a special event can be very stressful, so why do it alone? Let us put our expertise to work for you! Contact us to setup an appointment today!! We offer a FREE initial consultation! Before you plan your next big event, start ahead of the game. Give us a call, we'll take care of even the smallest details. After all, when the last guest leaves, we want your day to truly be 'A Special Occasion'. Our Hospitality staff is certified with years of professional experience in the food and beverage service industry. We have worked with a wide variety of PRIVATE CLIENTS, CATERERS AND CORPORATE ACCOUNTS throughout the Metro Atlanta Area. As professional Servers, we are dedicated to helping our clients with every intricate detail of your event.